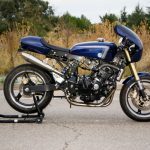 Just like a Café Racer or Scrambler, the definition of a Bratstyle motorcycle is not a complicated one. 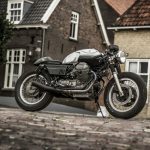 And as with a café racer, the bike is stripped down to its bare essentials but with a different styling. The biggest difference being, that a bratstyle motorcycle has a higher steer and (most often) a flat seat. 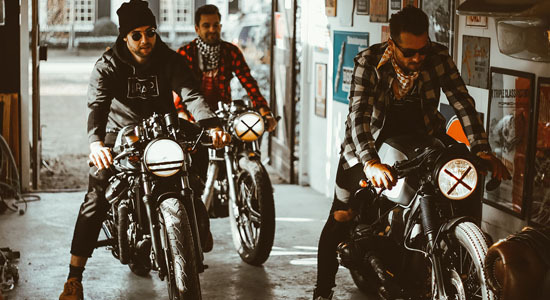 The name bratstyle originated in a custom motorcycle shop called Brat Style. 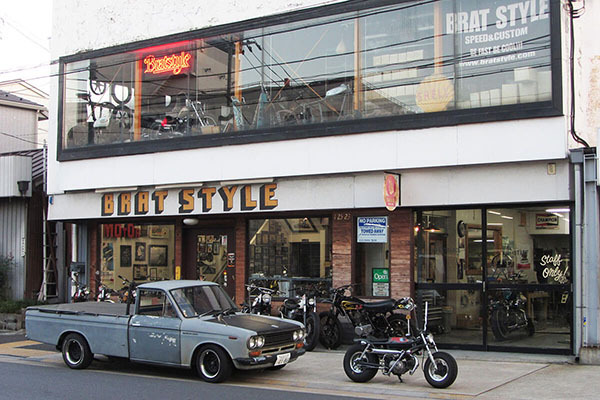 Their custom building “language” was replicated all over the world and they called them ‘Bratstyle’ motorcycles, just like a brand name. 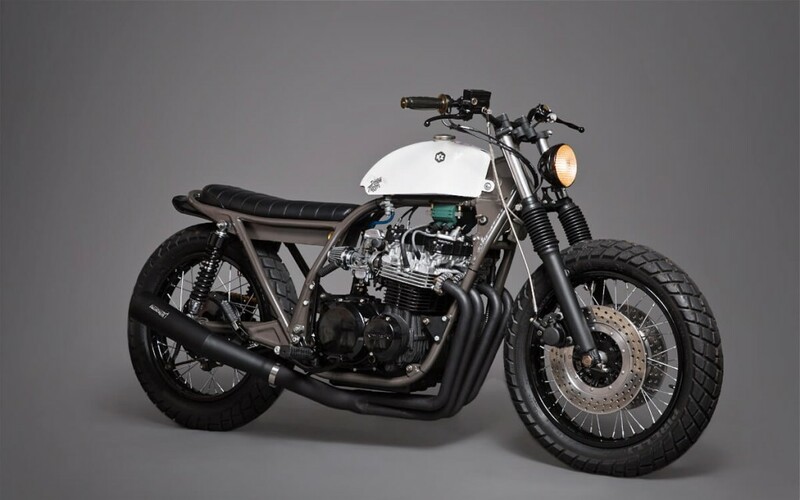 The shop, run by veteran bike builder Takamine in a Tokyo suburb, gained popularity by building small, lightweight, cheap, custom street bikes at a time when mega buck V- twins with ghastly paint jobs and zeppelin sized rear tires, were all the fashion. 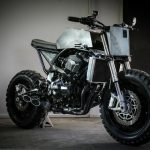 Although his shop had also established a name for itself building old school Harley bobbers, it was Takamine’s distinctly styled mid and small engine bikes, such as Yamaha XS650’s and 500cc singles, that really struck a chord with Japan’s young bikers looking for the next coolest trend. 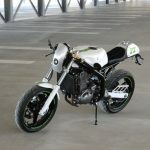 The shop’s style was pretty distinctive, yet had hints of tracker, café racer and street scrambler within the mix. Alterations to frame and cycle parts were comparatively low key – a deliberate choice, which not only kept them in the price range of young riders, but also didn’t detract from their ride-ability. Typically, bratstyle bikes had a fairly set formula consisting of back ends with suspension. More often than not, the original shocks are used or modern look-alikes, but definitely no hardtails. Seats were generally flat or bench type with enough room to carry a passenger as long as they were a good friend. Or occasionally a solo seat but no sprung saddles. As for handlebars, anything from mini apes to motocross bars, but absolutely no clip-ons. Fenders are either bobbed or trashed but never chromed. Engine finish either standard or blacked in and frame modifications kept to a minimum with alterations only to the rear frame loop so as to lower the seat height. Last but not least – gas tanks. 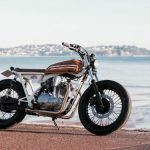 Here your average bratstyle runs with either the bike’s own stock tank or a slightly smaller aftermarket or vintage one that goes with the minimalist lines. Don’t forget, these were the basic design tenets of the original shop, whose style, thanks to the internet became so successful the biker world adopted it (or should that be hijacked?) 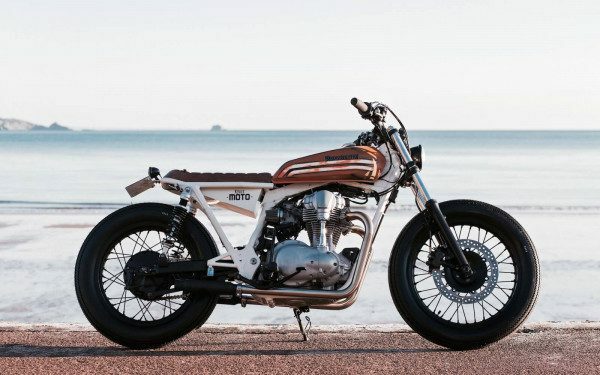 to encompass any bike built with minimalist style and a short seat.